Yesterday morning we made it out of bed bright and early and set out for Suzhou, a smaller city about 2 hours east of Shanghai. 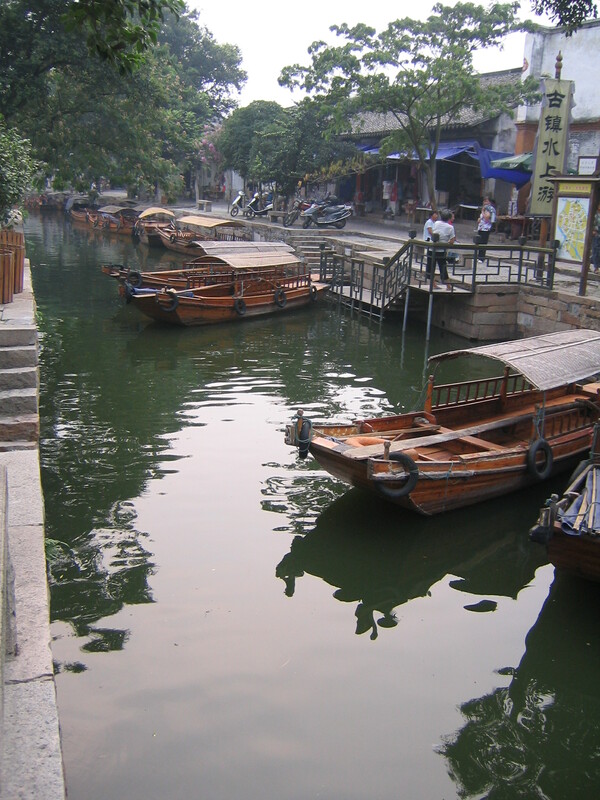 Suzhou is famous for it’s freshwater pearls, but it also has a large museum and a few Unesco World Heritage gardens. Mr. Shin dropped us off at the start of the main pedestrian walkway where we were immediately bombarded by touts who wanted us to take a ride in their boats. 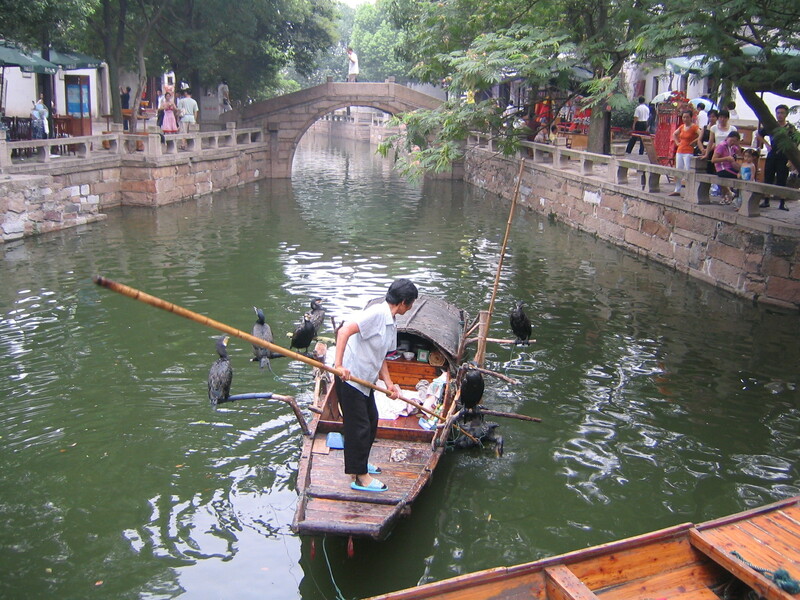 Suzhou is a canal town, more like Amsterdam than Venice, and there are a lot of little boats you can take. We declined and instead went right to the museum. 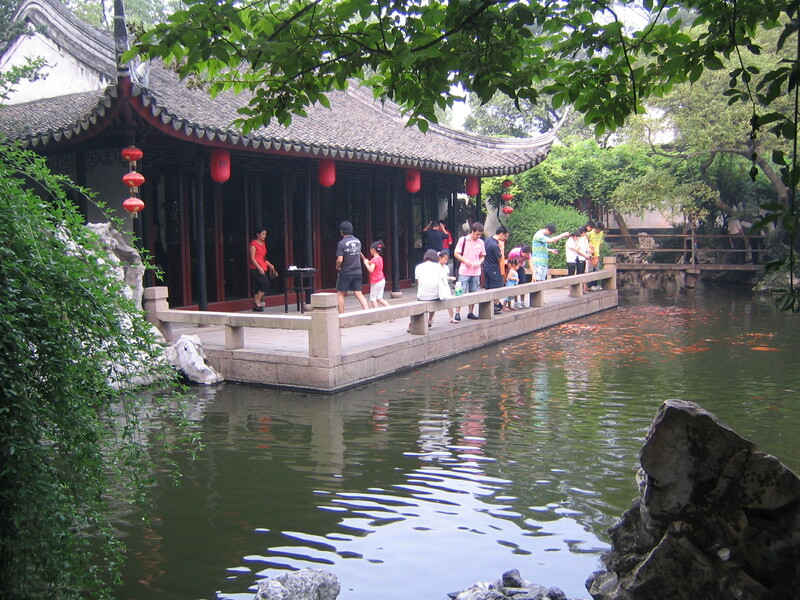 It was a new building and had a beautiful courtyard with a fishpond and bamboo gardens. The museum is mostly artifacts and was very nice, but the highlight was that it also included an entrance ticket into the Mansion of Prince Zhong. This was an old palace that has dozens of courtyards and rooms, many of which have old furniture on display or have been resorted to look as they would have 1,000 years ago. There was a huge area with a theater room, a temple room, and a whole bunch of other stuff that I couldn’t understand because there were no English signs, so we had to just do the best to infer some meaning from what we saw. After the museum we walked up the road to the Humble Administrator’s Garden, which was rather expensive (for China) but enormous. 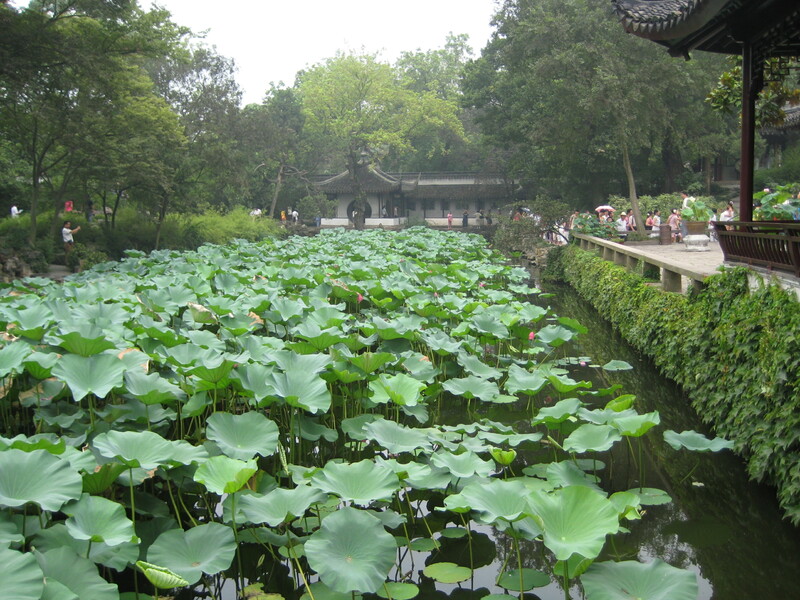 It’s one of the Unesco gardens and is very popular with the Chinese tourists, although we did see a few other foreigners there. 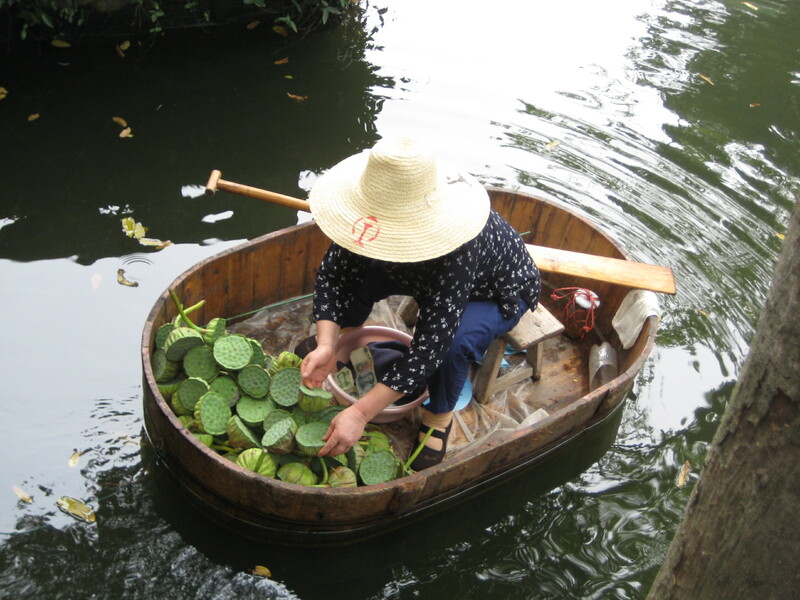 These gardens have large ponds filled with lotus flowers, little bridges and walkways that run throughout the garden, a variety of temples and small pagodas, a bonsai garden, and a little hut where you can get a can of beer for 25 cents. It was beautiful, but it was 95 degrees out and super humid, so we were roasting after about an hour. We managed to wander around for a while, but we ultimately gave in to the heat and called Mr. Shin to come and pick us up. 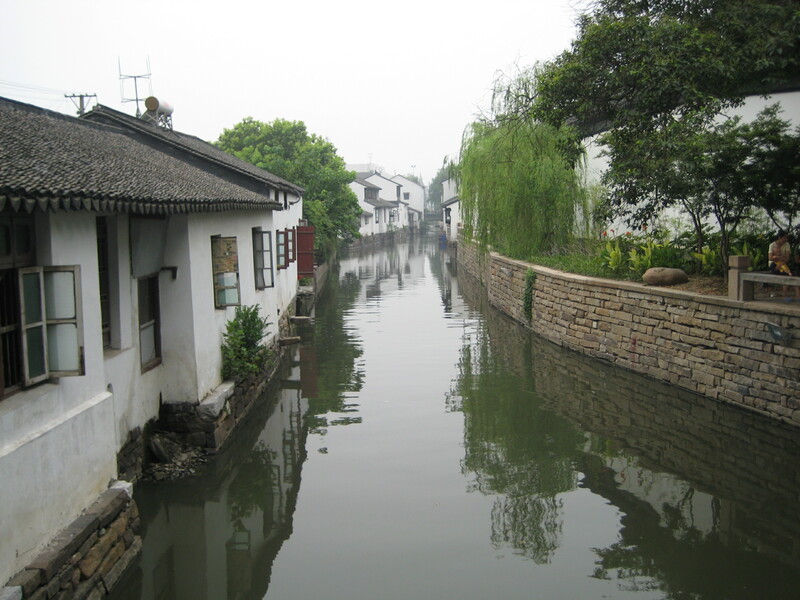 After we left Suzhou we headed out to Tong-Li, an ancient water-town (that you have to pay to get into…?) that was only about 30 minutes away. We decided to stop and have a real Chinese lunch at a non-western restaurant. Mr. Shin came in and helped us since there was no English menu. We ordered a fish (they brought it out live in a plastic bag for us to look at before they cooked it), a chicken, some sweet pork and peppers, some cooked vegetables, and some dumplings. All of it was rather good, though the chicken came with head and feet still attached. The fish was basically cooked whole and sliced open and you just had to pull it apart with the chopsticks, which was incredibly difficult. When we finished lunch we headed out to wander around the town. There are a lot of old mansions, and little museums to explore, but it was mostly nice to just walk around the streets and watch people. There are all kinds of little canals here, this village looks more like Venice, and you can hire a boat to take you around. At one point we saw a little fishing boat that uses these big birds to fish. They tie a string around the bird’s neck so it can’t fully swallow, and then they make it (don’t ask me how) dive down and get a fish. When it comes back up the fisherman grabs the bird by the neck, flips it upside down, and forces the fish out. These towns are easy to get to by car, though I’m fairly certain you can take a train or a bus directly from Shanghai. They are definitely worth a visit, especially if the weather is cooperative. ← How We Made The RTW Decision. The Long Version.